A star-dusted extravaganza, there will be a . 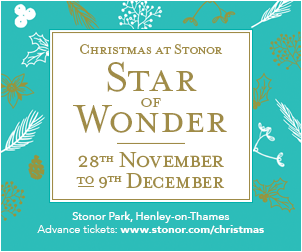 Delicious seasonal fare will be served in the Stonor Pantry and the gift shop will be overflowing with goodies for all the family. New for this year, we are introducing a special Candlelit Tour on Wednesday 28th November at 6.30pm where visitors will be able to see many of the rooms by candlelight and twinkling stars – please click here for more information.